Robert Pattinson, joined by Taylor Lautner, Jackson Rathbone, Peter Facinelli, Elizabeth Reaser and director Bill Condon, introduced an exclusive 90-second clip from Breaking Dawn Part 2 at the MTV Video Music Awards. 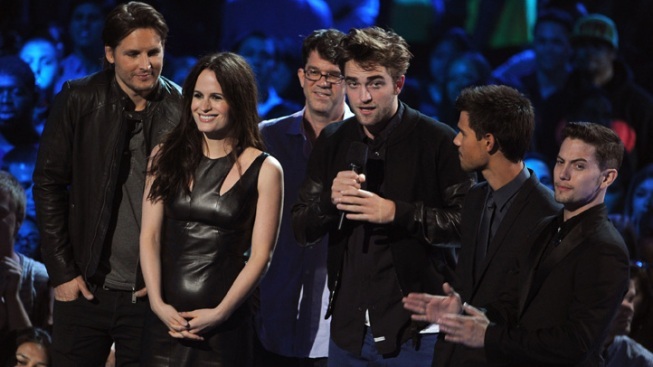 Actors Peter Facinelli, Elizabeth Reaser, director Bill Condon and actors Robert Pattinson, Taylor Lautner and Jackson Rathbone speak onstage during the 2012 MTV Video Music Awards. That wasn't so weird, now was it? Robert Pattinson, joined by Taylor Lautner, Jackson Rathbone, Peter Facinelli, Elizabeth Reaser and director Bill Condon, introduced an exclusive 90-second clip from Breaking Dawn Part 2 tonight at the MTV Video Music Awards--and, regardless of the real-life drama kicked up by Rob's leading lady, the juicy sneak peek surely got Twilight fans yearning for more. "For over four years, we've been working together as a family on the Twilight films--and this year, is the epic finale," Lautner began, making us wonder at first whether Pattinson was going to talk at all! "It's been an amazing journey and we'd like to thank all the fans of the series for your incredible enthusiasm from the beginning until now, the final chapter," said Pattinson, dressed pretty casually in an untucked button-down and blue pants. "This is an exclusive clip from The Twilight Saga: Breaking Dawn Part 2." Check out our MTV VMAs arrivals gallery! And with that, the audience and TV viewers were treated to 90 seconds of Stewart as Vampire Bella, the escalating feud between the Cullens (and their werewolf allies!) and the Volturi, lovely little Renesmee and Edward telling his beloved that he should know never to underestimate her. Asked on the red carpet whether he was missing Stewart's presence tonight, Rathbone (sorry, just Rathbone) smiled and told E! News he expects he'll be seeing her soon. "I think we're going to have a lot of time coming up once we get into the press whirlwind tour for Breaking Dawn Part 2 in two months," he said. "So I think we're going to see a lot of each other." The final film in the Twilight Saga hits theaters Nov. 16.